My friend Julie is a farm girl through and through. She grew up on a southern Wisconsin dairy farm. Julie is the type who works until the work is done. And she’ll take on just about anything. The other thing about Julie is that she doesn’t get sick. You might catch her with a raspy voice or the sniffles, but if you ask her if she’s coming down with something, she’ll laugh and say it’s nothing. Being sick was not part of her upbringing. You just don’t get sick on a dairy farm. Julie so doesn’t understand what it means to be sick or injured that sometimes I have to remind her to be sympathetic to her husband and children when they’re ailing. Not surprisingly, this dairy girl harbors a deep love of cheese. I’ll never forget one of the first times we were out to dinner and Julie ordered a cheese plate for dessert. Why cheese, I wondered, when we had access to things like molten chocolate cake, peach pavlova with tarragon ice cream, and warm pecan-wild rice cake with de leche sauce? But this was way back in the dark ages before I was properly educated about the beauty of good cheese. Though I still might go for the warm wild rice cake. I have made great strides in the world of cheese however. 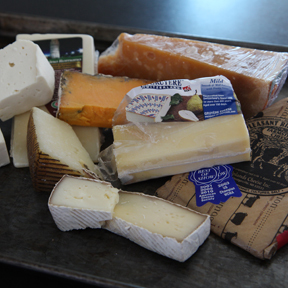 Generally you can find a handful of specialty cheeses nestled alongside the mozzarella and cheddar in my fridge. My cheese drawer is particularly well endowed at the moment. My friend Mary recently found her way to Fromagination in Madison and brought me back some true gems. I’m especially in love with a cheddar-blue duo. In the summers I practically live on Sassy Nanny’s fresh chev. Smeared on warm toast with honey for breakfast, paired with a tomato sandwich for lunch, and tossed in a grain salad for dinner. Those days can’t come soon enough. I regularly get e-mails from Julie, but a few weeks ago one message arrived with an alluring subject. “Grilled Cheese.” There was a link inside to what Julie described as the “photo contest I’ve been waiting for all of my life.” Are you aware there is a National Grilled Cheese Sandwich Day? No, me either. But there is, of course. In fact, it turns out that the entire month of April has been devoted to the grilled cheese sandwich. And to celebrate, Culture magazine held a photo contest. I’m okay with Grilled Cheese Sandwich month. A grilled cheese is a perfect work at home lunch. I love dreaming up wild combinations. Cheddar with mango and jalepeños, baby swiss with kraut and russian dressing, blue cheese with tomato and honey, gouda with apple and touch of horseradish. I’m not fussy and nothing perks up a dull work day like a little lunch time experiment. My routine is to get the griddle heating up, open the fridge and pull out a handful of things that might work together. I’m rarely disappointed. 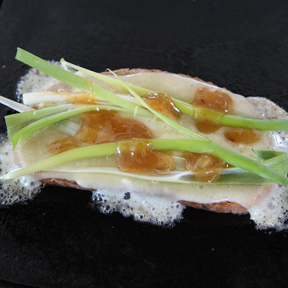 For my most recent sandwich trial I chose a creamy Grate Lakes Brie from the cheese drawer, julienned a few scallions, grilled it up on a light rye and topped it off with a hot mango chutney. In Julie’s honor, I dutifully got out the camera before gobbling it down. Hunger got the better of my creativity, but I sent in my submission to Culture anyway. Because I’d like nothing more than to win the big cheese prize and invite Julie over for dessert. Great photo! I can taste the sharp hot creamy flavors. You’re definitely a contender. Gorgeous Jill! My co-worker told me today that she couldn’t live without chocolate. I responded that I couldn’t live without good cheese. Thanks for entering. Yum, yum; you’re the bomb Jill!